Finally painted this piece up today; it was an ebay purchase some time ago. I was motivated to paint it up for a Muskets and Tomahawks scenario, of all things. It is planned to be a facsimile for the Dauphin Gate of Fortress Louisbourg. 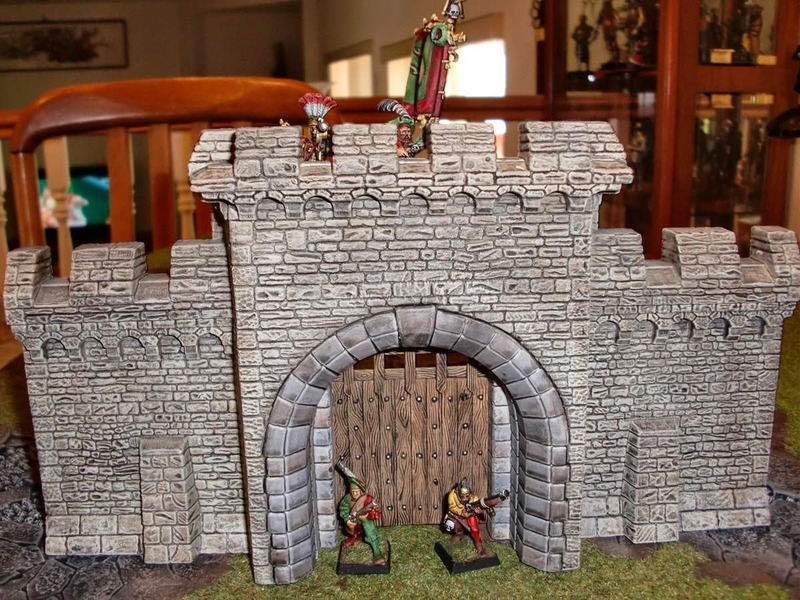 The actual gate was a bit more stylized, but this should work nonetheless. The obligatory Empire troops are stage around it for now. The walls were painted with Ceramcoat Sandstone, stained with Minwax Tudor Satin, and then dry-brush again with Sandstone - after being sprayed with Testors Dullcote. The stonework around the gate was given various shades of greys. 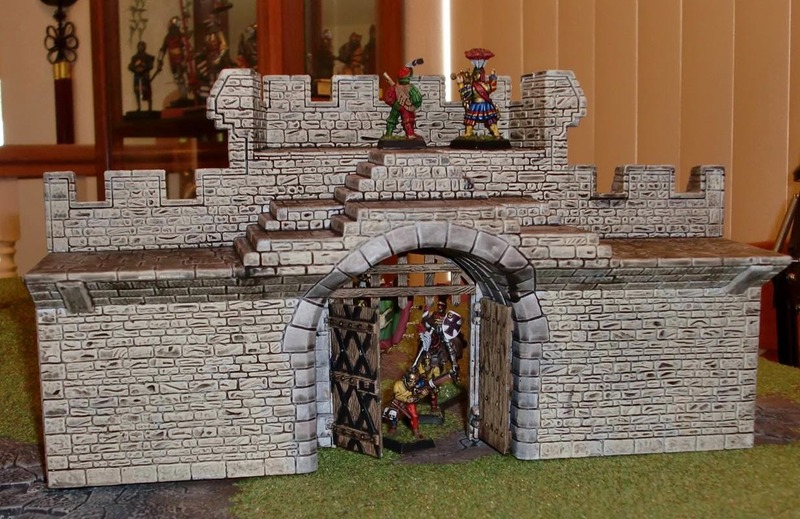 The gate and portcullis were painted a light brown - with metal parts picked out in blackened steel. The only thing in the painting queue right now is a lone Front Rank General Wolfe figure. However, due to the great weather here, I've been spending a lot of time in the yard. I tend to go overboard once I start pruning trees. 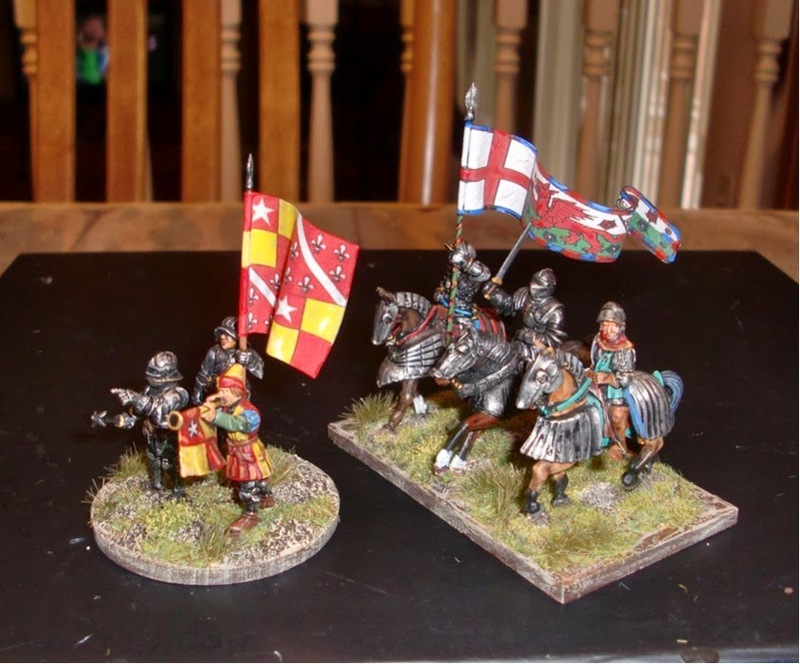 So here are the final two command stands for the Bosworth Field project. These two, Stanley and Northumberland, will be commanding the units that will either support or turn on Richard III. In reality they both did, the former by actively taking part in the fighting, and the latter by not committing his forces. I plan to use some kind of mechanism to allow either to support or turn on Richard for the game. The nice flags were once again downloaded from the Grumpy Wargamers site. Figures are from the plastic Perry War of the Roses Infantry set - except for the drum which a left over from the European Merc set. Both of these villains were fated to experience ignominious deaths: - the earl meeting his demise in 1489 during a tax revolt; Sir William losing his head in 1495 after yet another act of treason - this time against Henry. Interesting times indeed. 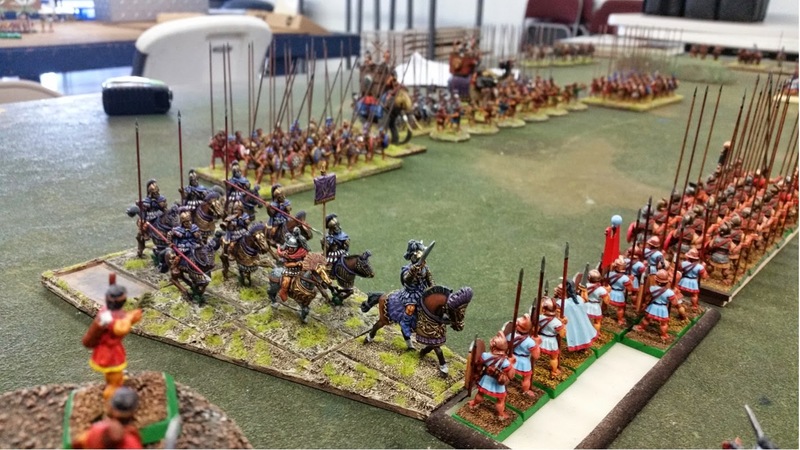 Being Northwest Historical Miniature Gaming Society's monthly game day today, Old Bob from Oregon and I met at the Game Matrix in Tacoma, WA for a fairly large Successors game using WAB 2.0 for rules. 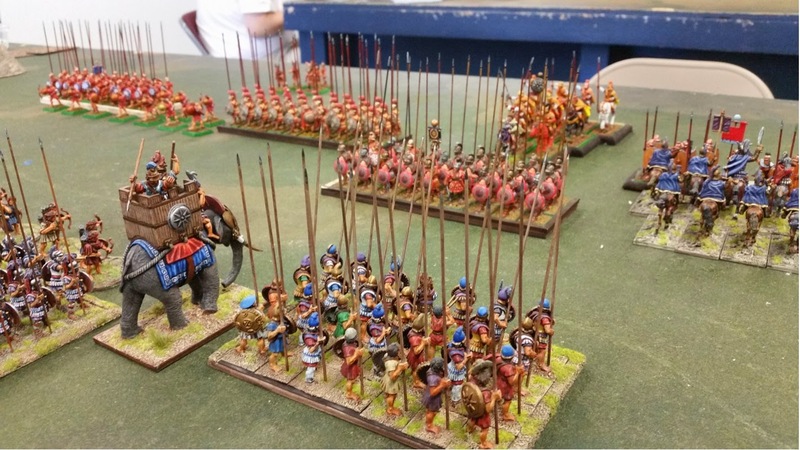 Bob brought his Ptolemaic army and I dusted off my old Seleucid army. As may be evident in the photos, I haven't rebased my phalanxes to the more optimum three ranks for wider frontage per 2.0. I don't play WAB often enough, so don't really mind when the Cool Kids lap me a bit in Combat. 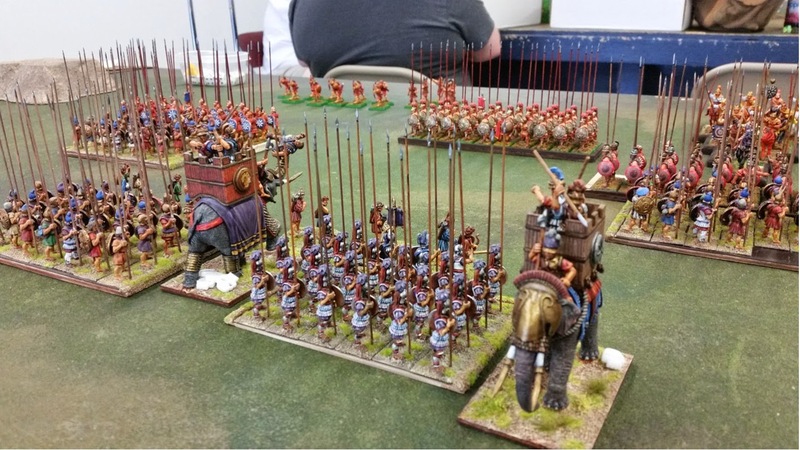 Pat L. (Socal Warhammer) also showed up with his Seleucids and played Bruce D.'s NKE army (which hadn't seen the gaming table for several years also). Seleucids at the start of the battle. 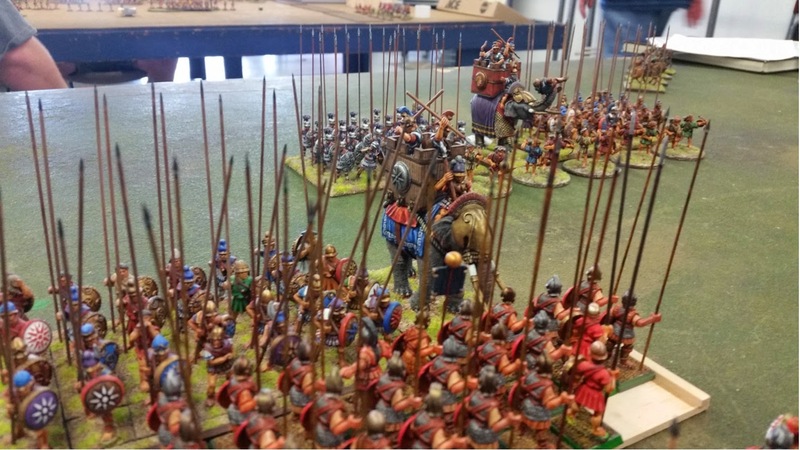 From their right to left: Agema cav in wedge, four units of phalanxes with two elephants in between the center units, Cretan archers screening, a scythed chariot, and out of the picture is a unit of Scythian mounted archers (who did very well the entire game). Unfortunately, the scythed chariot was destroyed by enemy missile fire before it could get into charge range. The Cretan archers did very well by taking out a battery of heavy ballista early in the battle. 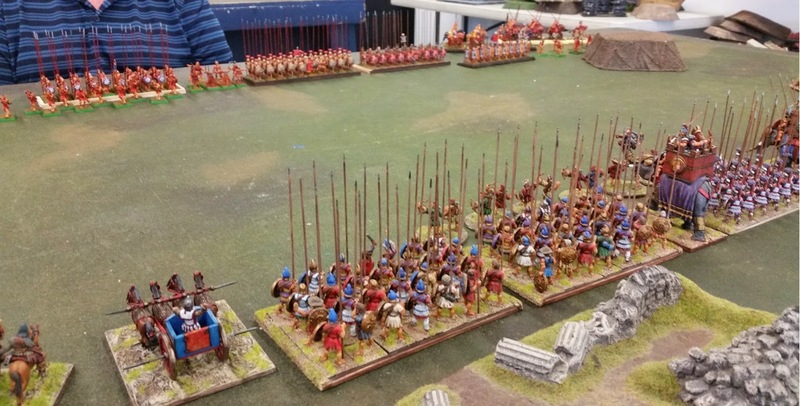 Agema cavalry wielding xyston in wedge on the Seleucid right. The phalanx units each had a character to boost their Leadership. The phalanx unit to the Agema left has the Army General, the one next having the Army Standard, and the other two having a taxiarch each. Both elephants have barding, howdah with shields and three crewmen - one each pike, javelin and bow - actually one only had two crew models, but I paid for three as I wanted the archer. Seleucid center with elephants interspersed between phalanxes. After losing an Agema cavalryman from pesky bow fire on the steep hill, the Agema wedge charges into a Peltast unit with javelins and thrusting spears. The missing rear rank of Peltasts being taken out by the charge. Agema cavalry flattened out after combat, but the Peltasts having passed their Leadership test held the cavalry in combat. With typically bad dice rolls, the Agema cav would eventually be whittled down to four and failing a Leadership test, had them fleeing off the table by Turn 6. 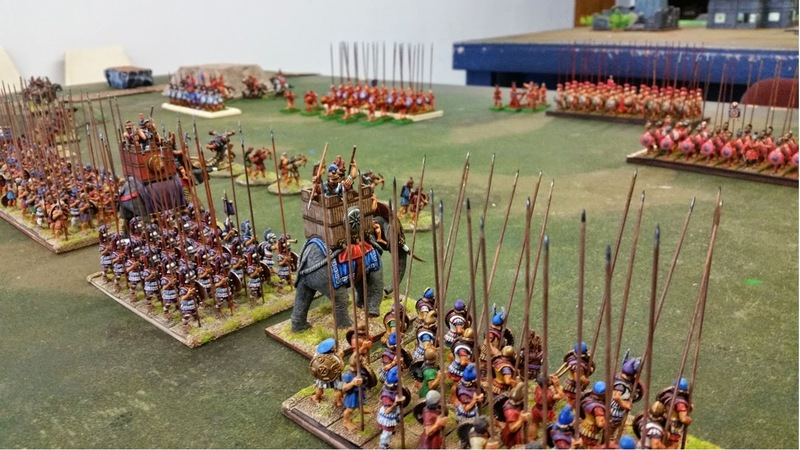 Ptolemaic and Seleucid center units bravely advancing towards each other. 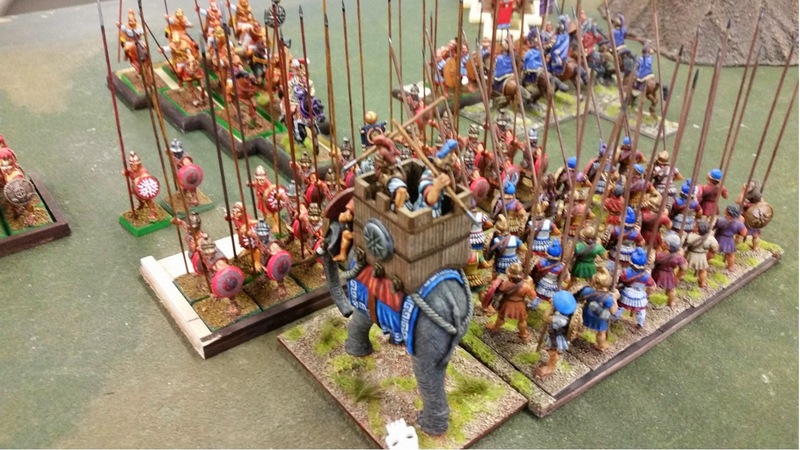 The elephant and phalanx on its right managed to charge into the phalanx unit to their front. 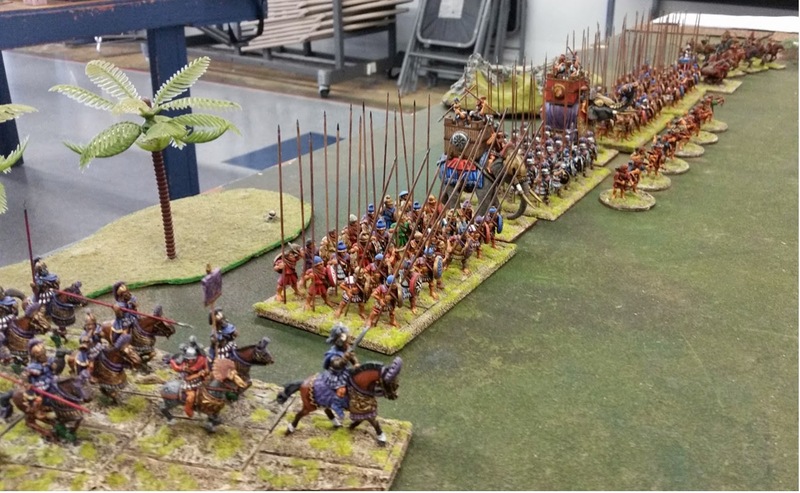 Don't ask me why Bob had one of his cavalry wedges behind the phalanx - but I was thankful for it. The Seleucids won the first round of combat, but the Ptolemaic forces consistently passed their Leadership tests to have multiple rounds of combat which eventually wore my phalangites out. Yes, the overlapping did come in handy for the Ptolemaics, but my attacks were pitiful unto themselves. The elephant eventually lost a round of combat, and failing its Leadership test stampeded back whence it came from - never to return to battle. Bye, bye elie. The phalanx unit with the Army General eventually failed a Leadership test after losing a round of combat in Turn 6, and decided the game in favor of the Ptolemies. At least the three other phalanx units, as well as the other elie managed to survive the battle. Anyway, we played a grueling 6 Turns and the Ptolemies got the better of the Seleucids through superior dice rolling. For once, I can say I was very satisfied with my tactics - but I am convinced my dice rolling is worthless. For instance, I don't remember how many times I rolled 14 dice and scored 2 hits - followed by even less wounds. My Army General with 3 attacks normally had no hits whatsoever! Oh, and when I needed to roll low for Leadership tests, I'd roll 9's or 10's followed by 11's or 12's with the Army Standard re-roll. Anyway, it was nice to take the Seleucids out from the cabinet where they hadn't seen any action for several years. Less the command figures - which will be done next. After Dullcote-ing the Minwax finish, some quick highlighting was added. The pikes will round out a unit with figures from the previous box of Mercenaries. They will be part of the force for Stanley. The bows will beef up the existing Lancastrian units; and finally, the billmen will flesh out the Yorkists, as well as a few for Stanley. 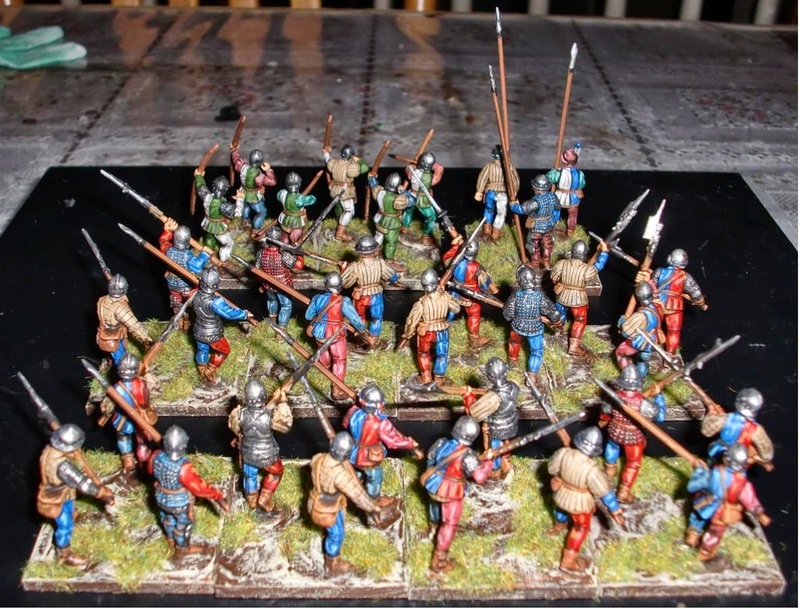 I don't plan on acquiring/painting anymore figures for this project (Bosworth Field using a simplified version of Hail Caesar), as I'm now interested in a Siege of Louisbourg game using a simplified version of Muskets and Tomahawks. Hopefully, the three boxes of Perry figures and an equal amount of Old Glory figures should be enough - units being scaled down to be representational more than anything. As soon as the command figures are painted, I intend to set up the units to get a better idea of planning the game/scenario. Block-painted and freshly stained with Minwax. 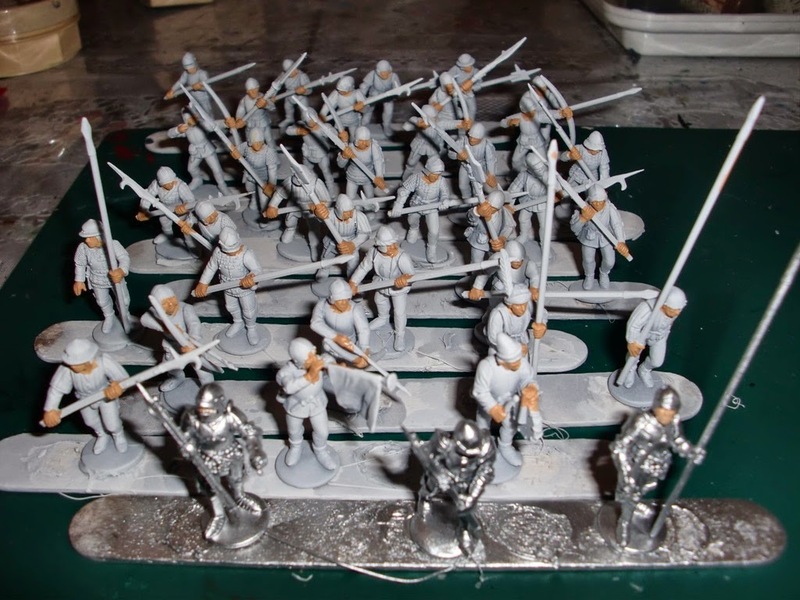 Still have the fully armored guys and the two musicians to paint, but this is the bulk of the figures from the second War of the Roses Infantry box for the Bosworth Field project. I like how the rivets/studs show up on the rear of the brigandine jackets. They'll be given a shot of Testors Dullcote when dried - and some highlighting will also be added. Here they are block painted right before the stain was brushed on. Picked up a second box of the plastic Perry War of the Roses Infantry set. Using a few spares parts from the earlier Perry sets, as well as several modified halberdier arms from some Games Workshop Empire guys, I was able to build several more units of billmen and pikemen. 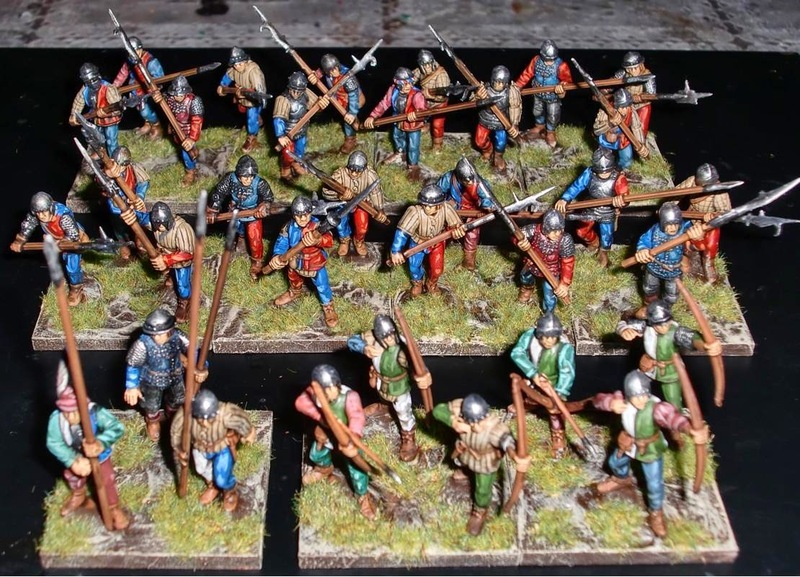 Two more foot commands and a few more longbowmen for the Lancastrians were also built. Once these are painted and based, they'll be set up on the table to see if more figures/units will be needed for the Bosworth game. I plan to have six commands - three Yorkists and three Lancastrians. Here are the newest figures after basecoating and flesh areas painted. 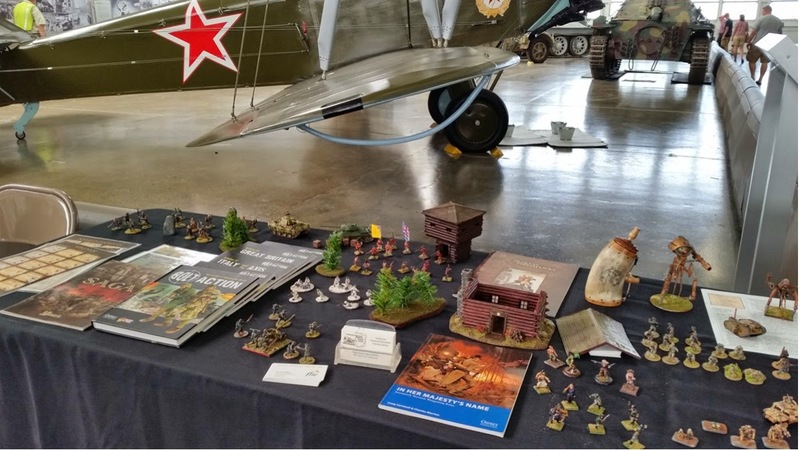 A handful of the Northwest Historical Miniature Gaming Society members made it up to the Flying Heritage Collection up in Everett, WA today. The newly "elected" president of the society, Sven Lugar, coordinated and hosted a wonderful event thanks in no small part the to Flying Heritage folks. Not only do we get in for free, but we get a personal tour of the collection. Today they flew several WW2 vintage aircraft in the marvelous weather. 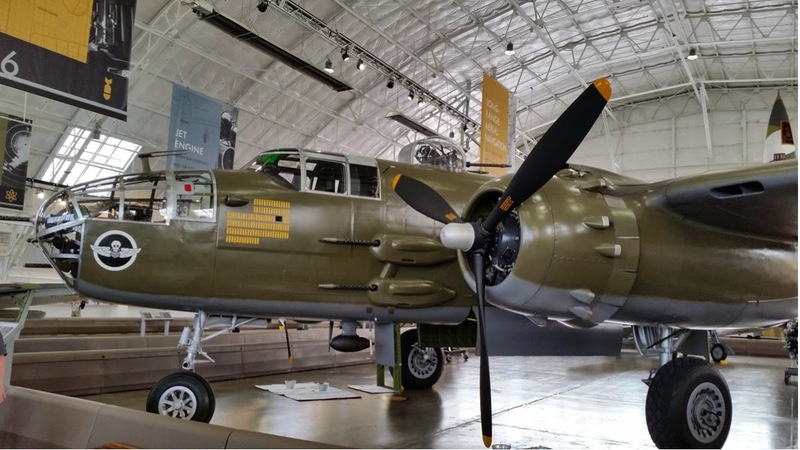 There was a Zero, P-47 and a couple more fighter aircraft which I failed to see. I only saw the Zero when it was taxiing after it's initial flight when I got there. 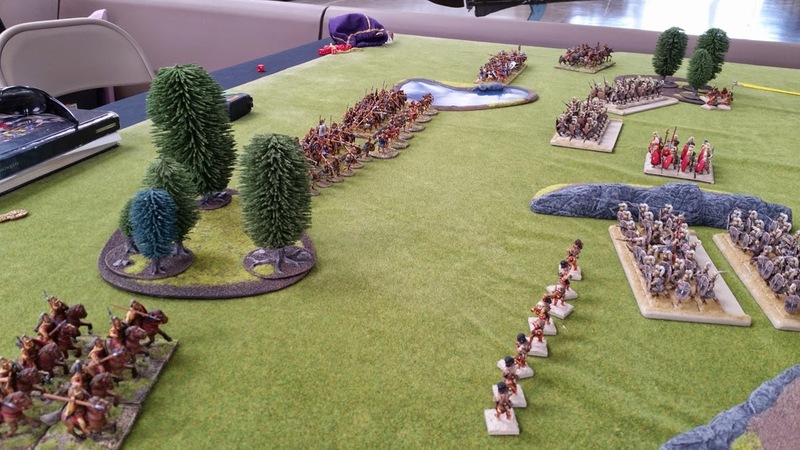 On the gaming side, Pat L. (Socal Warhammer) set up a WAB tournament, but due to lack of participants showing up it was basically a small affair. 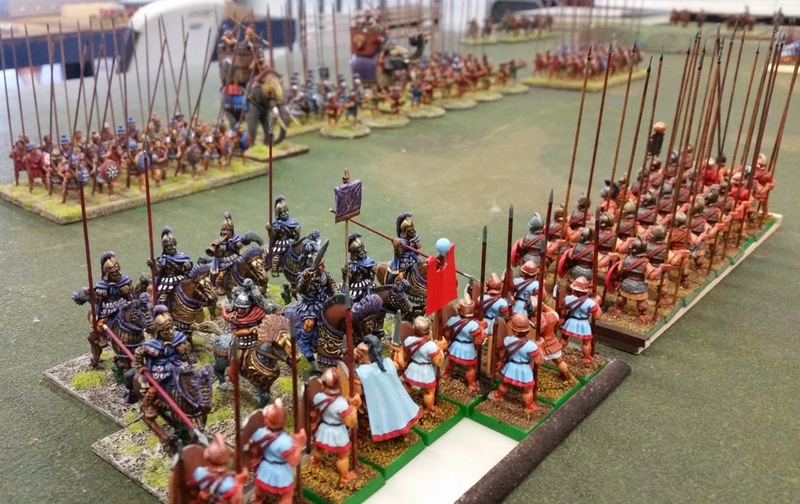 In the morning session, I had my Campanians weather the brutal attacks by my buddy Scott's Late Republican Romans. I failed to use my light troops more effectively, and basically had my two hoplite units take on several of his pila wielding units. Here are a few shots from the game. View from the Campanian right; Oscan cavalry with thrusting spears on the right wing. 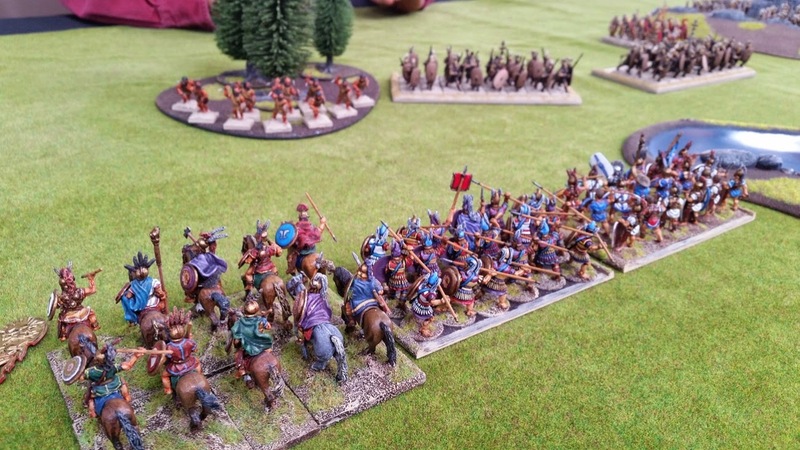 They ended up being routed off after combat with Roman infantry. 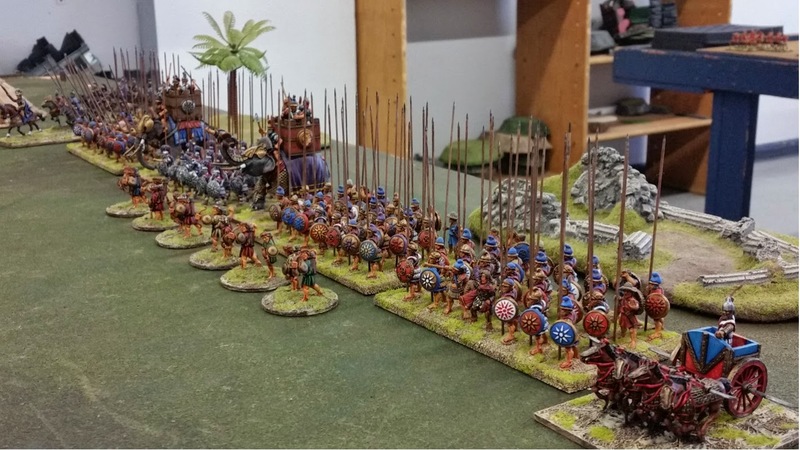 Campanian left - Oscan cavalry with javelins, allied Pyrrhic Guards with javelins and thrusting spears, and Oscan Warriors with thrusting spears - all Light units in Open Order. The Guards did manage to defeat an enemy infantry unit in combat. This after the enemy suffering a bit of shooting casualties from a nearby Cretan archer unit. 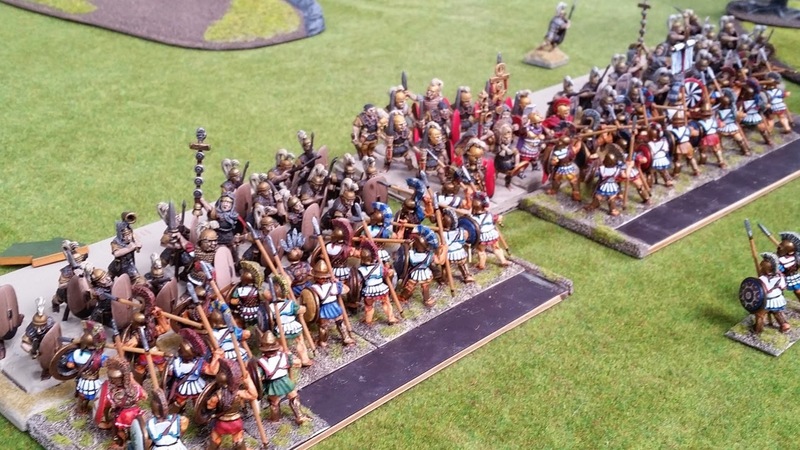 This is where it got ugly - Campanian hoplites - one unit with the Army General and Standard - stuck in combat with multiple units of Roman infantry. I believe we fought it out for three rounds - the unit with the Campanian General finally failing it's leadership test and being overtaken and destroyed by the enemy. This was at the bottom of Turn 6, so they lasted quite a while. The nice display set up by Sven. That powder horn is handmade by Sven - he gives one to the winner of his Musket & Tomahawks tournaments. He also awards drinking horns to his Saga tournament winners. Quite a worthy successor to Kevin Smyth - who headed NHMGS for many, many years. 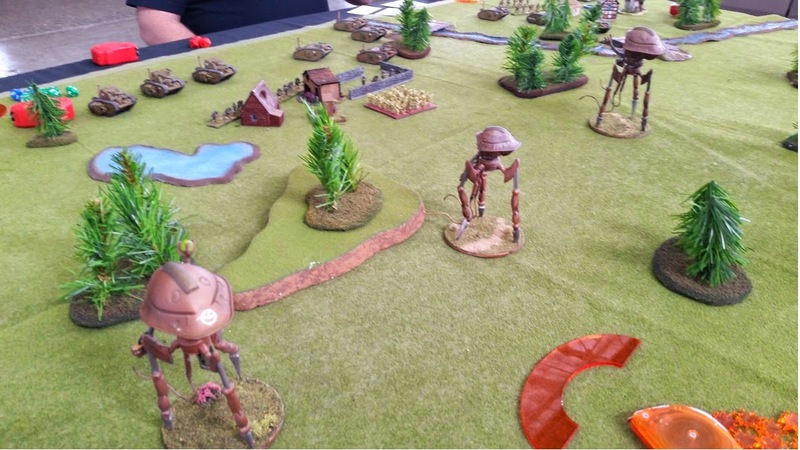 Besides the WABing - there was a Bolt Action game, an All Quiet on the Martian Front game was hosted by Sven, and a Muskets and Tomahawks game hosted by Daryl N. - which I got to play in for the first time. I really like the rules and plan to pick them up soon. 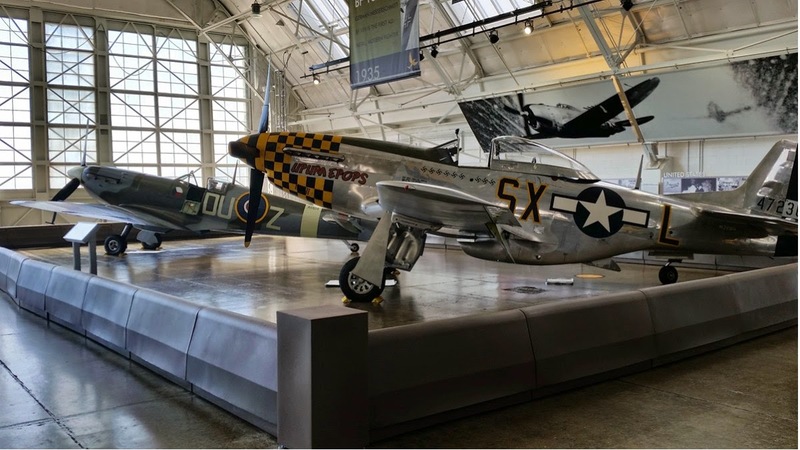 P-51 in working condition - as all of the aircraft and vehicles in the collection. I managed to get a clip of the Zero taxing when I first showed up in the morning. Sven caught the other aircraft and should be posting the video on the NHMGS Facebook. Finally printed out the banners/flags for the command groups after having my oldest boy set up the printer again.The mounted commands are Henry VII and Richard III. The foot commands are Oxford and Norfolk. All of the flags were found on the internet for free. The nice standards were found on the Grumpy Wargamers site. 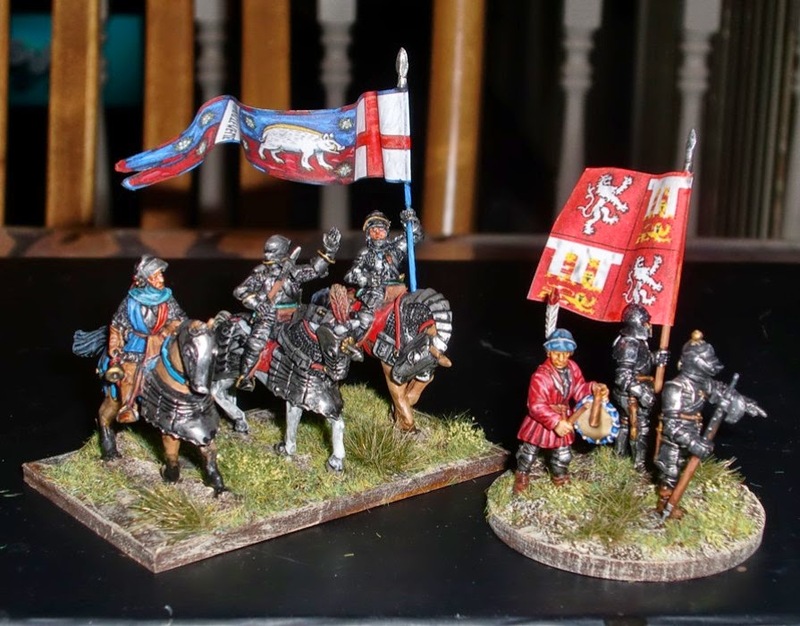 The mounted figures are all Old Glory save the figure for Henry which is a Crusader mini. The foot guys are all Perry plastics from either their WotR Infantry or European Merc sets. I plan to get a couple more boxes of plastic Perrys, and also have commands for Stanley and Northumberland. This in spite of my initial concept of using mostly figures I already had for the Bowsworth game. At least I won't have to get any mounted or dismounted knights - I have enough of them already.